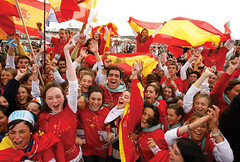 Further to the last post regarding media coverage of World Youth Day in Madrid we managed to find the blog posting on the Guardian website by a man called Andrew Brown who has written about the Popes’ visit to Spain in mixed terms. It is interesting to note he has noticed the BBC bias aswell when it comes to reporting anything to do with the Catholic Church. However it is laughable to read that he calls the World Youth Day pilgrims“quintessentially unfashionable” ! On the whole though the posting is sympathetic and quite rightly points out that a gathering of 1.5million young people to see the Pope is much more newsworthy than the feeble amount of demonstrators which were highlighted in BBC bulletins. His posting can be accessed http://www.guardian.co.uk/commentisfree/andrewbrown/2011/aug/18/pope-madrid-world-youth-day – perhaps you could respond to it on his blog?